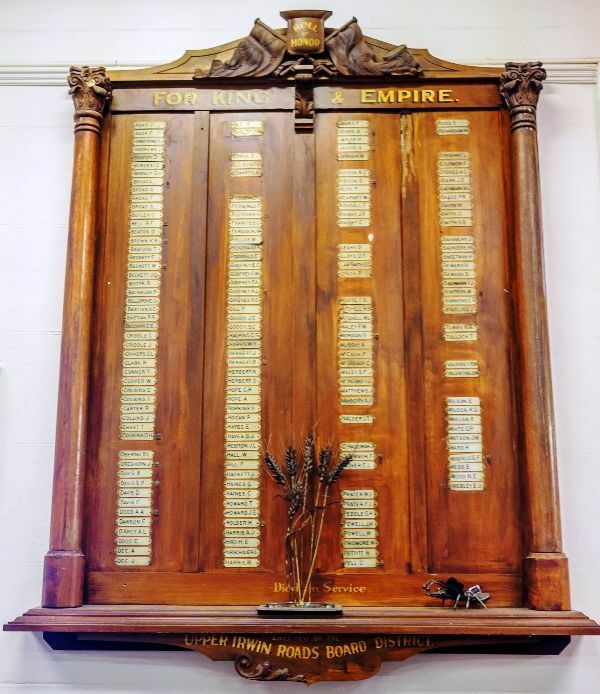 There was a very large attendance at the Agricultural Hall, Mingenew, on Friday last to witness the unveiling of the honor board. Mingenew has done her part in sending men to join the A.I.F. and there is hardly an eligible man left in the district. On the honor board there are 157 names, twenty of whom have paid the supreme sacrifice. The board is a credit to the people of Mingenew, and it compares favorably with any in the State. The design is well thought out. The names of the men are inscribed on nickel plates, with a crown alongside the names of the men who have given their lives for the Empire. The Colonial Treasurer and member for the district (Mr Jas. Gardiner) performed the unveiling ceremony, and spoke very feelingly of the glorious deeds of our men to uphold the high traditions of the British Empire, paying a high tribute to the Mingenew boys. Mr E. A. Field occupied the chair and deserves credit for the capable manner in which he carried out the proceedings. Addresses were also given by Messrs P. Bridge, Esq. (chairman of the local Recruiting Committee), W. S. Oliver, Lieut. Irwin Burges, Warrant Officer Podinner (Recruiting -Officer for the district), and Private Maybury, the latest recruit from the district There were a number of returned men in uniform on the stage. All the speakers were well received. The local band gave items during the afternoon and songs were given by Mrs Fields, Mrs Halpin, Mr Walter Jenner, and Mr Harris. In the evening a valedictory was given to Private Maybury. A large number turned up to wish the departing soldier God speed and a safe return, and Mr Jas. Gardiner, M.L.A., on behalf of the people, presented him with a handsome pocket diary. Private Maybury responded, and thanked the people for their kindness. Geraldton Guardian (WA), 27 June 1918.